Personal income tax collections are the largest component of federal revenue. However, these revenues come from many different sources of personal income, some of which fluctuate dramatically from year to year and are highly dependent on the business cycle, i.e. systematic variations in economic activity. Illustrating the impact of the business cycle, the newest IRS data reveals that the recent collapse of income tax revenues is largely the result of the Great Recession in combination with increasing reliance on business and investment income within the individual code. This also means we can expect collections to return to normal as soon as the economy does. Table 1 shows IRS data on the sources of personal income from 1990 to 2009, in billions of dollars. Table 2 shows the same data presented as shares of total income. Figure 1 graphs the major sources of income over this period. Total personal income grew steadily between 1990 and 2000, from $3.4 to $6.4 trillion, an increase of 87 percent. As a result of the 2001 recession, it then fell to $6.1 trillion by 2002, a decrease of 5 percent. Economic growth pushed personal income to $8.8 trillion by 2007, an increase of 44 percent, but the recent Great Recession cut personal income to $7.7 trillion by 2009, a decrease of 12 percent. Wages and salaries make up the largest source of personal income, averaging about 73 percent of total income over the last 20 years, as illustrated in Figure 2. In nominal terms, they grew steadily between 1990 and 2001, leveled off, and then began increasing again until they peaked in 2008 at $5.95 trillion, an increase of about 130 percent since 1990. In 2009 they decreased about 4 percent to $5.71 trillion. As Figure 2 demonstrates, wages and salaries as a share of personal income are relatively stable from year to year. To the extent that wages and salaries fluctuate as a share of personal income, it mostly reflects fluctuations in capital gains, which is the most volatile source of personal income. Capital gains income has fluctuated wildly as a source of personal income over the years. 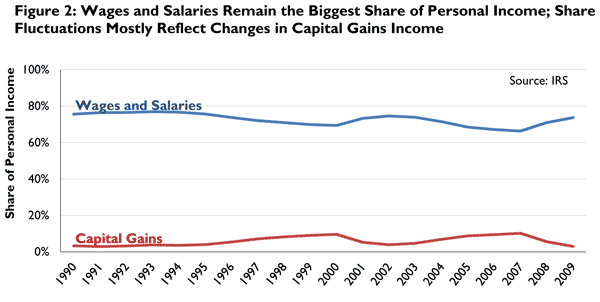 In 1990, capital gains were 3.3 percent of total income. By 2000, a bubble year for the stock market, capital gains peaked at 9.6 percent of income. In 2002, after the crash, it dropped to 3.9 percent of total income. By 2007, it peaked again at 10.2 percent of total income, but collapsed to 3.0 percent in 2009. Note: Each income source is net income minus losses. Total income only includes the taxable portions of each source. Ordinary dividends includes qualified dividends. Other income is all other sources of income minus foreign earned income exclusion, cancellation of debt, net operating loss and gambling income. Source: IRS, Table A. 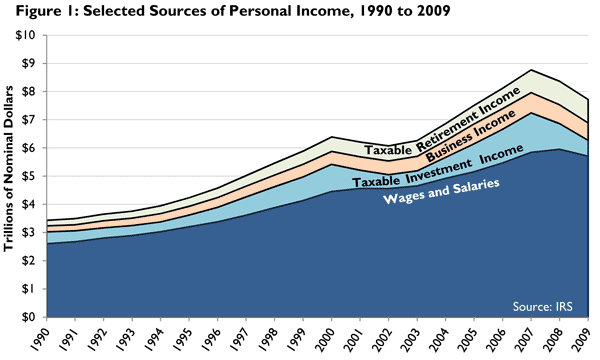 Selected Income and Tax Items for Tax Years, 1990-2009, in Current Dollars, http://www.irs.gov/taxstats/indtaxstats/article/0,,id=134951,00.html. Capital gains, dividends and interest compose investment income, which as a category is the second largest source of income, averaging about 11.4 percent of total income between 1990 and 2009. Compared to capital gains income, dividends and interest are not nearly so volatile from year to year. Dividends have fluctuated between 1.7 percent and 2.7 percent of total income. Interest income, along with interest rates, has generally declined as a share of income, from 6.6 percent in 1990 to 2.2 percent in 2009. In nominal terms, investment income peaked at $1.4 trillion in 2007, one year prior to the peak in wage and salary income, and fell 60 percent by 2009 to $563 billion. Most of this collapse was in capital gains, which fell 74 percent between 2007 and 2009, from $896 billion to $231 billion. Business income is another major category of personal income, and consists mainly of income from so-called pass-through entities, particularly S corporation, partnerships, sole proprietorships, and farms, but also includes rents, royalties, trusts, and estates. Farm losses exceeded income throughout this period, as indicated in Tables 1 and 2.
Business income averaged about 7.7 percent of total income between 1990 and 2009, and has generally trended upwards from a low of 6.0 percent in 1991 to a high of 9.4 percent in 2005. In nominal terms, business income peaked in 2006 at $732 billion and then fell 16 percent by 2009 to $616 billion. As illustrated in Figure 3, the fastest growing and now largest part of business income is income from S corporations, partnerships, rents, royalties, trusts, and estates, which grew from about 2 percent of personal income in 1990 to 5 percent in 2009. In nominal terms, it ranged from a low of $72 billion in 1991 to a high of $466 billion in 2006 before falling to $385 billion in 2009. Tables 3 and 4, which break out rents, royalties, trusts, and estates separately, indicate these are minor relative to income from S corporations and partnerships. Income from sole proprietorships experienced no such trend and in fact slightly decreased as a share of total income over this period, from 4.2 percent in 1990 to 3.2 percent in 2009. In nominal terms, income from sole proprietorships went from $141 million in 1990 to a peak of $282 billion in 2006 and then fell to $245 billion in 2009. The growth of S corporations over the last 20 years is due in part to the fact that S corporations offer many of the same legal benefits as C corporations, while certain restrictions have been lifted, particularly the limitation on the number of shareholders. Additionally, S corporations, along with other pass-through businesses, are subject to less tax than are C corporations. Except for the period 1993 to 2003, the top marginal rate on personal income, which applies to all pass-through income, has been below the rate on corporate income. Further, due to progressivity in the personal code, less profitable pass-through businesses pay an even lower rate. Finally, pass-through businesses are not subject to the additional double taxation of dividends and capital gains. The last major source of income is retirement income, which consists of IRAs, pensions, and social security benefits. It averages about 8 percent of personal income over this 20 year period. Due to the aging of the baby boomer generation, retirement income has steadily risen from 5.7 percent of total income in 1990 to 10.8 percent in 2009, making it now larger than both business income and investment income. For the most part, the components of retirement income have continued to increase through the Great Recession. Taxable IRA distributions, however, peaked in 2008 at $162 billion and fell to $135 billion in 2009. Taxable income from pensions continued to climb and reached $523 billion in 2009, while taxable social security benefits reached $175 billion. Finally, unemployment benefits typically are a small fraction of 1 percent of total income. Throughout the Great Recession, however, they have grown considerably and in 2009 reached 1.1 percent of total income. This is somewhat higher than the previous record of 0.9 percent of total income at the peak of the 1992 recession. In nominal terms, unemployment benefits were $84 billion in 2009, nearly double what they were in 2008. Tables 3 and 4 show the most recent IRS data, from 2009, on the sources of personal income by income bracket. Figure 4 shows the same data but only for the major sources. Wage and salary income makes up the majority of total income for those with an adjusted gross income of $1 million or less. For those with an adjusted gross income of $50,000 or less, non-wage sources of income are relatively minor, with retirement income being the second largest source of income, at about 14 percent of the total, followed by investment income, at about 5 percent, and business income, which is actually slightly negative due to business losses. Going up the income scale, business and investment income become larger sources of income. For those earning between $200,000 and $1 million, business income becomes the second largest source of income, at about 20 percent of the total, followed by investment income, at 9 percent, and retirement income, at 5 percent. For those earning $1 million or more, wage and salary income, business income, and investment income are roughly equal shares of total income, at about one third each, with retirement income close to zero. More precisely, these highest income earners receive about 28 percent of their income from partnerships and S corporations, and another 20 percent from capital gains. Business and investment income is not just volatile from year to year in aggregate, but also within each year from firm to firm and investor to investor. In any one year, almost half of businesses are unprofitable. Depending on the type of business, it is not uncommon to switch between profitability one year and unprofitability the next, e.g. due to large one-time expenses or the fact that new product lines always carry the risk of losses as well as the potential for profits. Likewise, particular investments involve a great deal of risk as well as reward. So, as basic finance theory predicts, these risky sources of income are concentrated among high-income earners. It follows then that high-income earner status is volatile and fleeting. For instance, about half of millionaires are millionaires for just one year, largely due to the volatility of capital gains. Note: Each income source is net income minus losses, in billions of dollars. Only taxable portions of each source are shown. Other income is all other sources of income minus foreign earned income exclusion, cancellation of debt, net operating loss and gambling income. The under $50,000 category of income includes those with no adjusted gross income, for whom there are additional losses not shown here, which makes the shown income sources add up to more than total personal income (about 7 percent more). For all income categories, the shown income sources do not add up precisely to total personal income due to rounding. Source: IRS, Table 1.4, All Returns: Sources of Income, Adjustments, and Tax Items, by Size of Adjusted Gross Income, Tax Year 2009, http://www.irs.gov/taxstats/indtaxstats/article/0,,id=134951,00.html. Note: Each income source is net income minus losses, as share of total personal income. Only taxable portions of each source are shown. Other income is all other sources of income minus foreign earned income exclusion, cancellation of debt, net operating loss and gambling income. The under $50,000 category of income includes those with no adjusted gross income, for whom there are additional losses not shown here, which makes the shown income sources add up to more than total personal income (about 7 percent more). 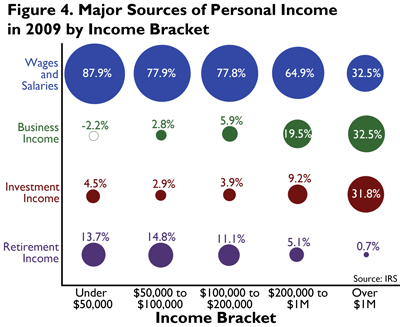 For all income categories, the shown income sources do not add up precisely to total personal income due to rounding. Note: Business income is net income minus loss from S corporations, partnerships, sole proprietorships, farms, estates, trusts, rent and royalty. Investment income is taxable interest, dividends, and net capital gains minus loss. Retirement income is taxable pensions, IRAs, and social security payments. The under $50,000 category of income includes those with no adjusted gross income, for whom there are additional losses not shown here, which makes the shown income sources add up to more than total personal income (about 7 percent more). For all income categories, the shown income sources do not add up precisely to total personal income due to rounding. In summary, wage and salary income is far and away the largest source of personal income, one that is relatively immune to fluctuations in the economy. In contrast, capital gains are extremely volatile, fluctuating dramatically with the stock market and the economy. Business income, particularly from S corporations and partnerships, is also relatively volatile and has been increasing as a share of total income over the last two decades. These two factors alone explain much of the recent collapse in income tax revenues, as the Great Recession crushed both profits and the stock market. We can thus expect income tax revenues to rebound, as profits and the stock market have seen significant growth since 2009. As far as the distribution of the sources of income, wage and salary income makes up the majority of total income for all those making $1 million or less. For those making more than $1 million, total income is split evenly between business income, investment income, and wage and salary income. Business and investment income is concentrated among high-income earners because it is inherently risky, and, as explained by basic finance theory, risk and reward go together. It is an interesting phenomenon that business income peaked in 2006, one year prior to investment income and two years prior to wages and salaries. The same pattern exists for corporate profits as measured by the IRS, and quarterly profits as measured by the Bureau of Economic Analysis (BEA) which peaked in the 3rd quarter of 2006. Wages are known to be “sticky,” so this might explain why they didn’t come down until 2009. The fact that profits peaked a full year before the stock market peaked in October 2007 indicates that investors were exceedingly exuberant at this time. These figures only count taxable retirement income, but a considerable portion of retirement income is non-taxable, as shown in Tables 1 and 2. See the work of William Sharpe, Harry Markowitz, and Merton Miller, who received a Nobel Prize for their development of the Capital Asset Pricing Model. Robert Carroll, Income Mobility and the Persistence of Millionaires, 1999 to 2007, Tax Foundation Special Report No. 180 (June 2010), https://files.taxfoundation.org/docs/sr180.pdf.